Chiropractic care aims to provide pain relief, improved function, and a better quality of life. Downing Chiropractic Center, LLC, treats the common conditions many folks experience such as back pain, headaches, joint pain, sprains, arthritis, injuries, neck pain, migraines and chronic pain, as well as stress and tension. At Downing Chiropractic, we coordinate our care with medical specialists, where indicated, and are equipped to provide soothing soft tissue therapies to accelerate the healing process and provide speedy relief. Dr. Frank A. Downing, Jr.
Past V.P.-Hampton Rds. Chiropractic Assn. All material provided on this website is provided for informational or educational purposes only. Consult a physician in person regarding all symptoms or medical conditions. We can not answer specific medical questions. Please read our complete disclaimer. 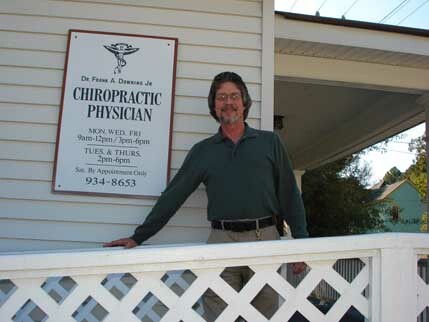 http://www.downingchiropractic.com This page was created on November 26, 1999 and last updated Thursday, August 19, 2010.